This entry was posted in Blog, Cards, Crafts, Embellishments, Lawn Fawn, Mojo Monday, Photopolymer, Pretty Pink Posh, Stamps and tagged Card Making, Crafts, Lawn Fawn, Mojo. Bookmark the permalink. 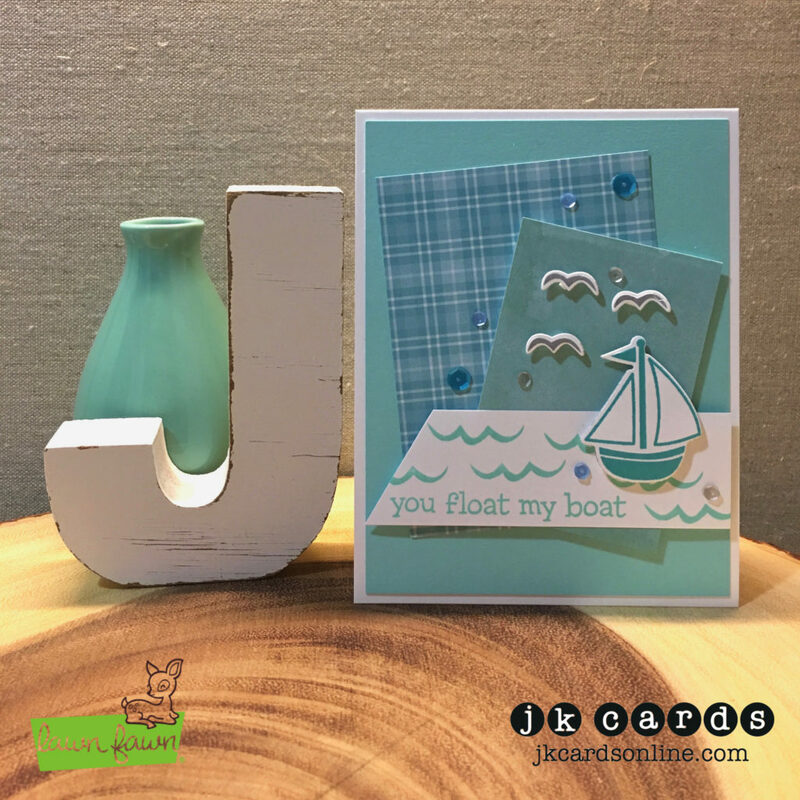 Love your card, Justin, with the pretty colors and the little boat. Cute greeting too. Glad you had a fun-packed day. I hope you caught a few zzzzzz’s on the train into the City, since you had such an early morning on Saturday. Have a great day, my friend. Great card!! Such a cute boat and I Love the sentiment! Thanks Grace! LOLOLOL!! I don’t like when they poop on my car either! Sometimes there are crab legs or shells in the parking lot by the Store, they drop them to break them. Love your card! Love anything to do with ocean or water also loving all the lawn fawn too. I have several stamps and die cuts but not this one! Must have it now. Oh those lazy summer days that we all miss…… Yep, WE always go by too fast. Please stop sending your weather back west. The flow is west to east. I am so sick of rain, dampness, gloom and I just heard the weather, SNOW on Wed into Thursday. I can’t wait for the Summer Linda! The weekends need to be at least three days, who do we speak to about that?! LOL! I didn’t know that I could do that! Hmm… not so funny now is it?! LOL! SNOW! Say it isn’t so! Crisp, clean, and really cool!